Rifles, Shotguns, Handguns, Ammo & Knives. Furniture, Asian Collectibles, Jewelry, Rugs, Lamps, Glassware, Porcelain, China and more. All sales final. All items sold as is. Accepting cash, check, major credit cards, and wire transfer. We only accept American Express for US bidders. 18% Buyers Premium, 3% discount for cash & good checks. Add/Delete rights reserved. All items must be paid for day of sale. Auctioneer may refuse any bid or bid increment deemed inappropriate. Phone and absentee bids accepted. NOTE: Firearms and ammo will be sold to US bidders ONLY. 6. We will ship items purchased by online, absentee or telephone bidding at the high bidder's request. Shipping will be invoiced and billed separately. Most packing, shipping and insurance are handled by Seymour Auctions. To economize, they will pack multiple items of similar size and type together if possible. Smalls will be shipped USPS Priority Mail with insurance. All large items will be shipped UPS-ground of FedEx with insurance. All items must be insured. A nominal fee of $5 per box is added for packaging and handling, slightly more for large orders or multiple items. For international shipping, please call for a quote. Questions regarding shipping costs, insurance and tracking should be directed to patty@seymourauctions.com. We ship within 3 days of payment. Please be sure your credit card information is valid and up to date before each auction to prevent a delay in shipping. Buyers of large freight (i.e. furniture) will be outsourced to your preferred shipper. All shipping charges are the responsibility of the high bidder. Firearms and Ammo will be sold to US Bidders ONLY! Firearms must be shipped to your local FFL dealer. Please have their FFL License copy with address with buyer's name, bidder name & number faxed to 843-278-6016. No firearms will be shipped to bidders unless it is pre-1898 or a firearm relics license is faxed to us. Background checks are processed by Seymour Auctions for all in-house bidders for firearms post-1898. BUYERS PREMIUM: A 15% buyer's premium will be added to each purchase. If your winning, high bid is $100.00 at check out you will be charged $120.00 plus 5% Live Premium Fee any applicable sale tax. Most items in this auction will ship via U.S. Mail, FedEx or UPS. Please note, we pride ourselves on getting your merchandise out to you quickly however in some cases it may take 7 to 10 business days to ship. With that said, most purchases will ship out the week following the Auction. The quicker you pay your invoice, the quicker you will get your merchandise. We support the United States Postal Service and will use U.S.P.S. Priority Mail whenever possible. We combine shipping to keep your cost down and will utilize other shipping services at Auction House discretion. We accept credit cards for payment for any US winning online bidders at all sales. We require credit card information to bid Invoices will be emailed after the auction. Buyers can also pay for the items at the scheduled pickup time. Prompt payment is required, bidder cards may be charged 4 days after an invoice has been sent. We do NOT charge credit cards without notifying the buyer first. Firearms must be shipped to your local FFL dealer. Please have their FFL License copy with address with buyer's name, bidder name & number emailed to patty@seymourauctions.com. No firearms will be shipped to bidders unless it is pre-1898 or a firearm relics license is sent to us. Background checks are processed by Seymour Auctions for local bidders for firearms post-1898. Lot 4: HASKELL Model JS45 Semi-Auto PISTOL, 45cal. 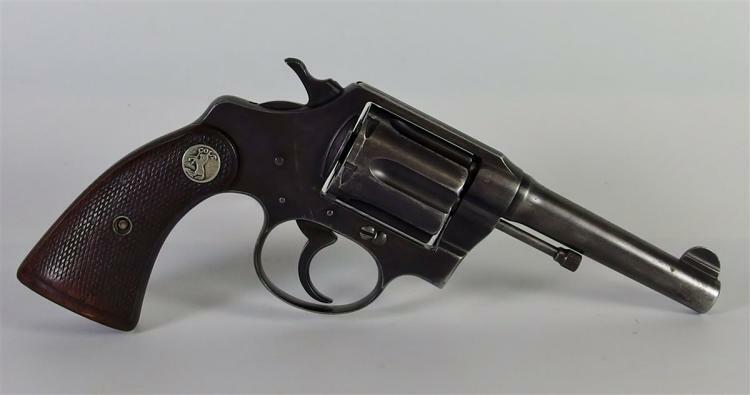 Lot 6: HIGH STANDARD Model Sentinel REVOLVER 357 cal. Lot 10: JENNINGS Bryco 38 Semi Auto PISTOL 380 cal. Lot 15: ALLEN HOPKINS Underhammer Model 25 Black Powder RIFLE 45 cal. Lot 16: CONNECTICUT VALLEY ARMS (CVA) Model Frontier Black Powder RIFLE 50 cal. Desert Storm 1991 Commemorative Edition.